The Dewalt DWS779 is a miter saw with a 12″ sliding compound mechanism. It’s equipped with a robust 3800 rpm, 15 amp motor that’s capable of delivering extended durability and performance. The saw also comprises an extremely efficient dust collection mechanism that can arrest more than 75 percent of the dust created. Also, the miter saw comes with a unique back fence design that can cut up lumber at various lengths and angles. 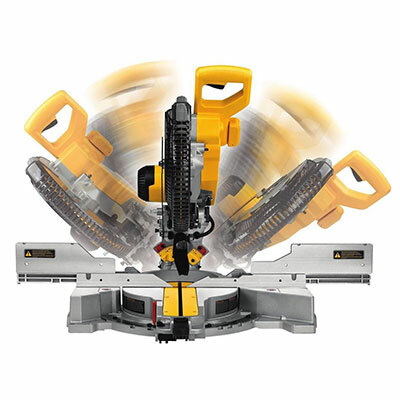 In this Dewalt sliding compound miter saw review, we’ll look at some of the pros and cons of the saw and other aspects that shall help you determine if the saw is the best sliding compound miter saw available. Right out of the package, the saw is calibrated to make accurate cuts. The bevel and straight cuts are perfect, with the stock blade doing a fairly decent job. The standard blade provided should be good enough for basic carpentry and should last long if not abused. Despite being powerful, the DWS779 motor is quiet and smooth at work. The saw base is also fairly substantial in weight, which means the saw won’t get knocked out or slide from position when the motor is activated. There’s not much difference between this model and the DWS780. The only differentiating factor is that the DWS780 has the XPS system. XPS system omission shouldn’t be a major concern since you’re getting this saw for a much cheaper price (almost $200 cheaper) compared to the DWS780. As aforementioned, the blade provided works fairly well. However, if you’re looking for better cuts and finishes, a blade upgrade becomes necessary. The dust bag provided isn’t the most spacious. However, it still manages to do its job quite well. The saw doesn’t come with a laser guide. If you cannot work without the laser, it could be a problem. However, if you can manage without the laser, you would also end up paying lesser when compared to paying for laser-equipped saws. Q – Does the model have an LED cut line? A – No, the Dewalt DWS779 doesn’t have an LED cut line. Q – DWS779 VS DWS780? A – The biggest difference is the price; we’re talking a savings of 200.00. The DW780 Has a laser guided blade XPS system. What does this mean? Absolutely nothing that anyone would notice. I personally own the dewalt 779 model and I’ve owned it for nearly 5 years and I have nothing but good things to say about it. However, if you really need a laser guided blade, then by all means, the DWS780 is a great miter saw. Q – What blade size does this saw use: 5/8 or 1 inch? A – There’s an adapter available with this saw, which is either for 1 or 5/8-inch blades. Out of the box, the arbor is 5/8. 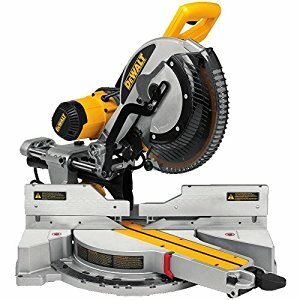 Q – Can you predetermine depth cut with this saw? A – Yes, the saw comes with a depth stop that could be altered to restrict depth cut. But since this is manual, arriving at the right depth would entail a bit of trial and error. Q – Where is the saw made? A – Like most other miter saws, the Dewalt DWS779 is also made in China. Q – Are clamps part of the package when you buy the saw with a stand? A – Yes, the clamps are included. The Dewalt DWS779 is one of the most praised and applauded miter saws in its category. This model is targeted at mid- to professional-level users. If you are an amateur, you might be better off starting with a less powerful and less expensive machine. People who have the money and the requirement would not be disappointed at all with this miter saw’s performance, versatility, and durability. As I’ve mentioned earlier, I own this saw and knock out trim, crown and other types of finish carpentry five-days a week. This saw with a Fuede blade will do the job for you quite nicely.